Definition at line 43 of file SpillPlacement.h. BorderConstraint - A basic block has separate constraints for entry and exit. Block doesn't care / variable not live. Block entry/exit prefers a register. Block entry/exit prefers a stack slot. 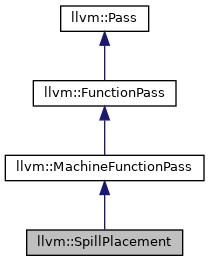 Block entry prefers both register and stack. A register is impossible, variable must be spilled. Definition at line 80 of file SpillPlacement.h. Definition at line 75 of file SpillPlacement.h. Definition at line 76 of file SpillPlacement.h. addConstraints - Add constraints and biases. addConstraints - Compute node biases and weights from a set of constraints. This method may be called more than once to accumulate constraints. LiveBlocks Constraints for blocks that have the variable live in or live out. Set a bit in NodeMask for each active node. Definition at line 263 of file SpillPlacement.cpp. References llvm::ArrayRef< T >::begin(), DontCare, E, llvm::ArrayRef< T >::end(), I, llvm::ARM_AM::ib, and nodes. addLinks - Add transparent blocks with the given numbers. Definition at line 300 of file SpillPlacement.cpp. References llvm::ArrayRef< T >::begin(), E, llvm::ArrayRef< T >::end(), I, llvm::ARM_AM::ib, nodes, and llvm::Number. addPrefSpill - Add PrefSpill constraints to all blocks listed. This is equivalent to calling addConstraint with identical BlockConstraints with Entry = Exit = PrefSpill, and ChangesValue = false. Blocks Array of block numbers that prefer to spill in and out. Strong When true, double the negative bias for these blocks. Definition at line 285 of file SpillPlacement.cpp. References llvm::ArrayRef< T >::begin(), E, llvm::ArrayRef< T >::end(), I, llvm::ARM_AM::ib, nodes, and PrefSpill. finish - Compute the optimal spill code placement given the constraints. No MustSpill constraints will be violated, and the smallest possible number of PrefX constraints will be violated, weighted by expected execution frequencies. The selected bundles are returned in the bitvector passed to prepare(). True if a perfect solution was found, allowing the variable to be in a register through all relevant bundles. Definition at line 370 of file SpillPlacement.cpp. References assert(), nodes, and llvm::SpillPlacement::Node::preferReg(). getBlockFrequency - Return the estimated block execution frequency per function invocation. Definition at line 152 of file SpillPlacement.h. getRecentPositive - Return an array of bundles that became positive during the previous call to scanActiveBundles or iterate. Definition at line 139 of file SpillPlacement.h. iterate - Update the network iteratively until convergence, or new bundles are found. iterate - Repeatedly update the Hopfield nodes until stability or the maximum number of iterations is reached. Definition at line 341 of file SpillPlacement.cpp. References nodes, llvm::SpillPlacement::Node::preferReg(), and llvm::SpillPlacement::Node::update(). prepare - Reset state and prepare for a new spill placement computation. RegBundles Bit vector to receive the edge bundles where the variable should be kept in a register. Each bit corresponds to an edge bundle, a set bit means the variable should be kept in a register through the bundle. A clear bit means the variable should be spilled. This vector is retained. Definition at line 360 of file SpillPlacement.cpp. scanActiveBundles - Perform an initial scan of all bundles activated by addConstraints and addLinks, updating their state. Add all the bundles that now prefer a register to RecentPositive. Prepare internal data structures for iterate. Return true is there are any positive nodes. Definition at line 318 of file SpillPlacement.cpp. 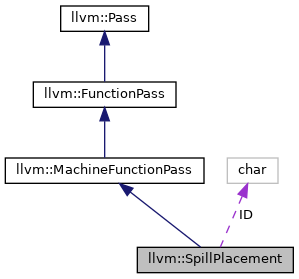 References llvm::SpillPlacement::Node::mustSpill(), nodes, llvm::SpillPlacement::Node::preferReg(), and llvm::SpillPlacement::Node::update(). Definition at line 73 of file SpillPlacement.h.